Since the onset of the global financial crisis, many economies have faced lower growth in their productive capacity, which may slow the rise of living standards in the future, according to a new study by the IMF. Global output growth fell sharply during the global financial crisis, and a new study published in the IMF’s April 2015 World Economic Outlook report suggests that a considerable portion of this slowdown is due to economies facing lower “speed limits”. An economy’s speed limit—referred to as potential output growth—dictates how rapidly it can expand its production of goods and services without increasing inflation. The evidence presented in the study suggests that absent policy action to encourage innovation, promote investment in productive capital, and counteract the negative impetus from aging, countries will have to adjust to a new reality of lower speed limits. Potential output measures a country’s productive capacity with stable inflation. It depends on the supply of two factors of production—labor and capital inputs—and how productively they are used. For potential output to grow, either the supply of these factors or productivity has to grow. In the years since the global financial crisis many economies have witnessed slower expansions in one or more of these key components of potential output growth (see chart 1). Lower potential growth in advanced economies has been driven in roughly equal measure by slower capital accumulation and labor growth—due primarily to adverse demographics. In emerging market economies much of the decline is attributable to slower productivity growth. Going forward: what can we expect? As economic conditions improve and activity recovers, investment growth should pick up, fostering a gradual recovery in productive capital growth in many advanced economies. However, prospects for the labor force are grimmer. As chart 2 shows, demographic factors are likely to act as a brake on growth in many advanced and emerging market economies, as populations age and workers retire. Productivity growth is not expected to pick up under current policies. In emerging market economies, past technological improvements and enhanced educational attainment have allowed these economies to narrow the gap between themselves and advanced economies. Although more strong growth can still be achieved from further improvements in these areas, the returns to education and innovation are unlikely to be as large as they were initially, when these economies were further from the technological frontier. This suggests weaker productivity growth in these economies in the future. For their part, advanced economies should see productivity growth near recent rates in coming years. Still, the rapid pace of expansion seen in the late 1990s and early 2000s—fueled by the exceptional information-communication-technology boom—is unlikely to be restored. In sum, these scenarios suggest that potential growth in advanced economies is likely to remain below precrisis rates, while it is expected to decrease further in emerging market economies in the medium term (see chart 3). These findings imply that living standards may expand more slowly in the future. In addition, fiscal sustainability will be more difficult to maintain as the tax base will grow more slowly. There is still room for optimism—the future trajectory of potential output is not set in stone. • Innovation can be encouraged and productivity can be enhanced with greater support for research and development—this can be achieved by strengthening patent systems and adopting well-designed tax incentives and subsidies in economies where these are low. • Worker productivity can be increased by improving education quality and boosting secondary- and tertiary-level attainment. • Bottlenecks that are holding back production in some emerging market economies can be eliminated through higher infrastructure spending. • There is scope for better business conditions and improved functioning of product markets in some countries. • Labor-force participation must be promoted, particularly among female workers in some countries, and aging workers in others—this would entail better designed tax and expenditure policies in some economies. • Demand support through monetary and, where feasible, fiscal policy remains important in several economies to boost investment and capital growth. 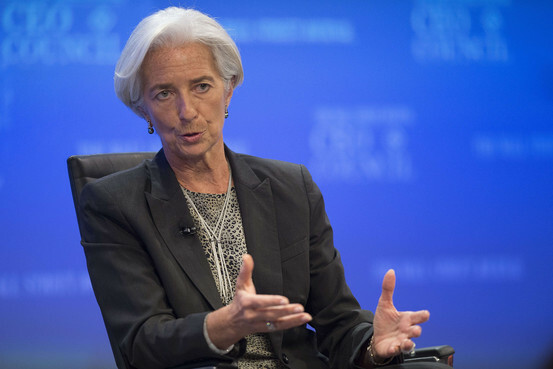 Christine Lagarde, managing director of the International Monetary Fund, last year. Fearful that turmoil is brewing in opaque areas of the global financial system, the International Monetary Fund is renewing its call for greater oversight of the so-called shadow-banking industry. “The evidence calls for a better supervision of institution-level risks,” the fund said Wednesday in a new assessment of the global financial system. “Currently, the oversight of the industry focuses on investor protection and disclosure, and regulators conduct little monitoring in most countries,” the fund said. In the wake of the financial crisis, regulators around the world tightened oversight of the traditional banking sector. That bolstered the safety of one part of the financial sector. But lending–and risks—have since migrated to the shadow-banking industry. The sector, which includes mutual funds, exchange-traded funds, hedge funds and other institutional investors, has ballooned since the financial crisis. 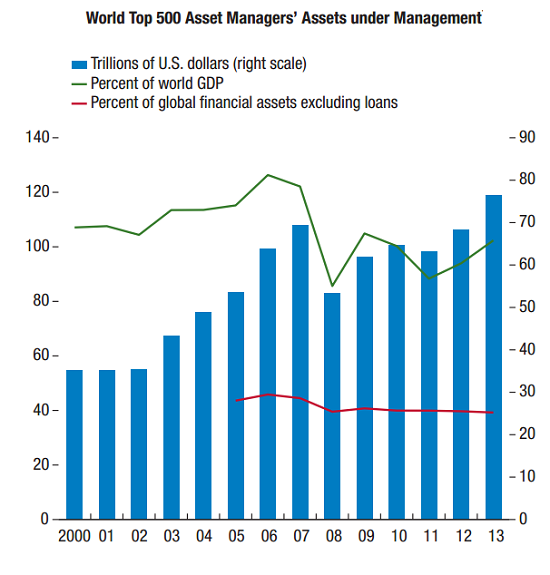 It now has over $75 trillion in assets. The IMF has identified several key risks where regulators and investors need to pay greater heed. A large number of assets are managed by a small number of institutional investors. That means any change in the consensus on interest rates or the global economy can send shock waves through markets as those investors moved in or (more importantly) out of equities, bonds or currencies. “If funds exacerbate the volatility of capital flows in and out of emerging markets or increase the likelihood of contagion, significant consequences will be endured by the recipient economies,” the fund warned. If investors rush to the exits en masse, acting as a herd, asset prices could plummet and markets could face funding problems. “One cannot take for granted that liquidity will be there when markets become under stress,” IMF financial counselor José Viñals said late last year. And while shares of many funds are freely tradable, the assets in the portfolio are often a lot less liquid. That can effectively pour sand into the gears of the financial system. That liquidity mismatch is most notable among bond mutual funds, especially corporate and emerging market debt funds, the IMF said. One way to prevent liquidity mismatch problems, the IMF suggests, is through redemption fees. “Regulators should find ways to reduce the incentive for investors to withdraw their money when they see others exiting,” said Gaston Gelos, a senior author of the report. When a group of weary diplomats announced a framework for an Iranian nuclear accord last week in Lausanne, there was one diplomat in the mix whose feigned enthusiasm was hard to miss. Russian Foreign Minister Sergei Lavrov left the talks at their most critical point March 30, much to the annoyance of U.S. Secretary of State John Kerry, who apparently had to call him personally to persuade him to return. Even as Lavrov spoke positively to journalists about the negotiations throughout the week, he still seemed to have better things to do than pull all-nighters for a deal that effectively gives the United States one less problem to worry about in the Middle East and a greater capacity to focus on the Russian periphery. Russia has no interest in seeing a nuclear-armed Iran in the neighborhood, but the mere threat of an unshackled Iranian nuclear program and a hostile relationship between Washington and Tehran provided just the level of distraction Moscow needed to keep the United States from committing serious attention to Russia's former Soviet sphere. Russia tried its best to keep the Americans and Iranians apart. Offers to sell Iran advanced air defense systems were designed to poke holes in U.S. threats to bomb Iranian nuclear facilities. Teams of Russian nuclear experts whetted Iran's appetite for civilian nuclear power with offers to build additional power reactors. Russian banks did their part to help Iran circumvent financial sanctions. The Russian plan all along was not to help Iran get the bomb but to use its leverage with a thorny player in the Middle East to get the United States into a negotiation on issues vital to Russia's national security interests. So if Washington wanted to resolve its Iran problem, it would have to pull back on issues like ballistic missile defense in Central Europe, which Moscow saw early on as the first of several U.S. steps to encircle Russia. Things obviously did not work according to the Russian plan. As we anticipated, the United States and Iran ultimately came together in a bilateral negotiation to resolve their main differences. Now the United States and Iran are on a path toward normalization at a time when Russian President Vladimir Putin is trying simultaneously to defend against a U.S.-led military alliance building along Russia's European frontier and to manage an economic crisis and power struggle at home. And the situation does not look any better for Russia on the energy front. The likelihood of the United States and Iran reaching a deal this summer means that additional barrels of Iranian oil eventually will make their way to the market, further depressing the price of oil, as well as the Russian ruble. To be clear, Iranian oil is not going to flood the market instantaneously with the signing of a deal. Iran is believed to have as much as 35 million barrels of crude in storage that it could offload quickly once export sanctions are terminated by the Europeans and eased by the United States via presidential waiver. But Iran will face complications in trying to bring its mature fields back online. Enhanced recovery techniques to revive mothballed fields take money and infrastructure, which is difficult to apply when oil prices are hovering around $50 per barrel. Under current conditions, Iran can bring some 400,000-500,000 barrels per day back online over the course of a year, but this will be a gradual process as Iran vies for foreign investment in its dilapidated energy sector. U.S. investors will likely remain shackled by the core Iran Sanctions Act until at least the end of 2016, when the legislation is set to expire. However, European and Asian investors will be among the first to begin repairing Iran's oil fields, as long as Iran does its part in improving contractual terms and the economics make sense for firms already cutting back their capital expenditures. The rehabilitation of Iran's energy sector, however gradual a process that may be, will complicate Russia's uphill battle in trying to maintain its energy leverage over Europe. Russia is a critical supplier of energy to Europe, currently providing about 29 percent and 37 percent of Europe's natural gas and oil needs, respectively. An additional 50 billion cubic meters of natural gas available for export from the United States within the next five years will not be able to compete with Russia on price because of the low operational and transport costs of Russian natural gas. Even so, the United States will still be creating more supply in the natural gas market overall to give Europe the option of paying more for its energy security should the political considerations outweigh the economic cost. The Baltic states are already working toward this option, with Lithuania taking the lead in creating a mini-liquefied natural gas hub for the region to try to reduce, if not eliminate, Baltic dependence on Russia. This year, Poland is debuting its own LNG facility, and the Sabine Pass terminal in Louisiana is scheduled to bring the first LNG exports from the Lower 48 to market, with shipments already contracted for Asia. In Southern Europe, the picture for Russia is more complicated but still distressing. Aside from the significant issue of cost for energy companies already cutting their capital expenditures, Turkey's veto on the transit of LNG tankers through the Bosporus effectively neutralizes any LNG import facility project on the Black Sea. But Europe is proceeding apace with the much more economically palatable option of building pipeline interconnectors across Southeastern Europe. This does little to dilute Russia's control over energy supply, but it does strip Moscow of its ability to politicize pricing in Europe. Pipeline politics in Europe have allowed Russia to reward — and punish — its Eastern European neighbors through pricing contracts. However, Brussels is more thoroughly examining contracts signed by EU member states for this very reason and in line with one of the main tenets of the EU's Third Energy Package, which seeks to break monopolies by splitting energy production and transmission and to implement fair pricing. Meanwhile, the construction of interconnectors allows member states to influence pricing downstream from Russia. This gambit has been on display over the past year in Ukraine. Kiev depended heavily on its neighbors in Slovakia, Poland and Hungary for reverse flows of Russian natural gas at discounted rates to stand up to Russia's energy swaggering. Though Russian natural gas will still be flowing primarily through these pipelines, the expansion of interconnectors will open up options for non-Russian natural gas from the North Sea and from LNG terminals in Northern Europe to make their way southward to embattled frontline states such as Ukraine. Russia thought it would be able to keep a hook in Southern Europe through the construction of South Stream, a mammoth pipeline project with a $30 billion price tag and 63-bcm capacity that sought to cut Ukraine out of the equation by moving natural gas across the Black Sea and through the Balkans and Central Europe. The combination of plunging energy prices and growing EU resistance to another pipeline that would allow Russia to draw political favors sent this project to the graveyard, but Russia had a backup plan. The Turkish Stream pipeline would make landfall in Turkey after crossing the Black Sea, before using the Trans-Adriatic Pipeline and the Trans-Anatolian Pipeline to feed Southern Europe through the web of interconnectors and pipelines already in development. On the surface, Moscow's plan appears quite brilliant: Use the very infrastructure that Europe was already counting on to diversify away from Russia and then, when the political skirmishing over Ukraine eventually settles down, reinsert itself into Europe's energy mix via a willing partner like Turkey. But the plan remains full of holes. Someone needs to pay for the main pipeline expansion between Russia and Turkey, and both countries will struggle to find private investors in this geopolitical and pricing climate. Moreover, there is no indication that the Europeans will be willing to take additional Russian natural gas from a yet-to-be-built Turkish Stream when a perfectly good pipeline running from Russia to Eastern Europe already exists. Russia does not have the option of refusing natural gas shipments when it is already desperate for those energy revenues. In the end, this is a Russian bluff that the Europeans will not be afraid to call. When Putin agreed to a three-month natural gas deal with Ukraine last week (with a huge discount to boot, at $247.20 per thousand cubic meters), he likely did so realizing that Russia playing hardball with Ukraine on energy would only spur further investment and construction into pipelines and connectors in Southeastern Europe that would accelerate the decline of Russia's energy influence in Europe. The best he can hope for is to slow that timeline down. Not only will Russia's pricing leverage wane in Europe over the long term, but its influence on Europe's energy supply also will decrease over the longer run. Azerbaijan was the first southern corridor supplier to Europe circumventing Russia and is now expanding that role by bringing natural gas from its Shah Deniz II offshore fields online for export. Turkmenistan is still vulnerable to Russian meddling but has been increasingly willing to host Turkish and European investors looking to build a pipeline across the Caspian to feed Europe. Whether these talks translate into action will depend on the Turkmen government's political will to stand up to Moscow, not to mention legal battles over the Caspian Sea. But while the lengthy courting of Ashgabat by the West continues, a rehabilitated Iran is now the latest addition to the list to join the southern corridor. Just a day after the Iranian nuclear framework deal was announced, Russia's state-owned RIA Novosti published a story quoting Igor Korotchenko, the head of the Moscow-based Center for Analysis of World Arms Trade, as saying it would be a "perfectly logical development" for Russia to follow through on a sale of S-300 surface-to-air missiles to Iran if the embargo is lifted. Korotchenko noted that specifications to the deal would have to be made as "the United States is watching very closely" to whom Russia sells these weapons. Russian Deputy Foreign Minister Sergei Ryabkov also made a point to say the U.N. arms embargo against Iran should be lifted as part of the nuclear deal. These well-timed statements likely caught Washington's eye but probably did little to impress. The S-300 threat mattered a lot more when the United States needed to maintain a credible military deterrent against Iran. If the United States and Iran reach an understanding that neutralizes that threat through political means, Russian talk of S-300s is mostly hot air. This was a small yet revealing illustration of Russia's declining position in the Middle East. For many years, the Middle East was a rose garden for the Russians, filled with both sweet-smelling opportunities to lure Washington into negotiations and ample thorns to prick their American adversary when the need arose. Russia's support for the Syrian government is still relevant, and Moscow will continue to court countries in the region with arms deals out of both political and economic necessity. Even so, bringing down the Syrian government is not on Washington's to-do list, and countries like Egypt will still end up prioritizing their relationship with the United States in the end. Russia's influence in the Middle East is fading rapidly at the same time Europe is starting to wriggle out of Russia's energy grip. And as Russia's options are narrowing, U.S. options are multiplying in both the Middle East and Europe. This is an uncomfortable situation for Putin, to be sure. But a narrow set of options for Russia in its near abroad does not make those options any less concerning for the United States as the standoff between Washington and Moscow continues. In response to Republican questioning on monetary policy and employment, Bernanke replied the Fed Already Follows Policy Rule. "The Fed already has a rule," Mr. Bernanke said during a panel discussion at the Brookings Institution's Hutchins Center on Fiscal and Monetary Policy. "It's committed to hitting a 2% inflation target and aiming for the natural rate of unemployment. These are rules." Of course, Bernanke failed to admit the rule makes no sense, and it doesn't. Leaving aside the ridiculousness of a 2% inflation target while ignoring asset bubbles, it is impossible for the Fed to target two things at once. For example: The Fed can set interest rate policy but then it has no control over money supply. The Fed can target money supply, but then it would lose control over interest rates. And the Fed cannot target employment at all. Thus his comment on "rules" is complete silliness. Moreover, there is no such thing as a "natural rate of unemployment" given central bank and government interference. Raise the minimum wage and employment goes down vs. what it would otherwise do. Hand out enough free benefits and people have no desire to work. The more disability fraud government allows, the less incentive people have to work. Logic would dictate the unemployment rate would go up as a result of the three points above. It doesn't because the unemployment rate is carefully defined in such a manner that it doesn't. If you are in school and working you are in the labor force and employed. If you are in school and not working you are not in the labor force and therefore not unemployed. If you collect disability and are not working, you are not unemployed no matter how fraudulent the disability claim. Not employed and looking for a job on Monster or in the want-ads? Sorry, that does not count. You are not in the pool of the unemployed. The list goes on and on, and it is hugely arbitrary. The BLS makes every effort to ensure you are not counted as unemployed if you are not working. Don't blame the BLS, they are just following the rules. Right now, the BLS says the unemployment rate is 5.5%. Bernanke believes the "natural unemployment" rate may be lower than he thought previously. Of course, if you hand out enough free benefits, the unemployment rate would drop to zero given the way the unemployment rate is calculated. One is either employed or not. The "non-employment rate" calculation is easy enough: ((civilian population - employment) / civilian population) * 100. Let's define unemployment the same as non-employment. There are a few potential problems but numerous benefits with this method, so let's discuss them. Point number 1: The unemployment equals non-employment calculation is so simple that changes in the previous definitions of unemployment vanishes. Calculations of who wants a job, who is looking for a job, etc., vanishes, as does disability fraud. This is to the clear advantage of the non-employment = unemployment definition. Point number 2: With the aging workforce, boomers are retiring en masse. People live longer than they ever have. Many keep working because they want to. Many others want to work past age 65 but are frustrated by the lack of opportunities and stopped looking. Still others have built up a sufficient nest egg and retired early. Untangling all that is very difficult under current rules as what constitutes unemployment. Thus, in the non-employment = unemployment model, demographic skew enters into play. Point number 3: Starting in the 1960s, an increasing number of women entered the work force. Some women took jobs because they wanted to, others because they had to. Right now, it is safe to conclude we are not going back to an environment where following marriage, the male head of household works and the female stays home taking care of the kids. Point number 4: More kids than ever before are going to college. Many go on to higher education. But what about people returning to college not because they want to but because they are out of a job and feel like they need to? In the non-employment = unemployment model, education skew enters into play. However, those who would rather be working than in school are properly accounted for. Is it possible to normalize the above? I believe it is. Point number 1 is self-explanatory. It automatically normalizes previous definition changes via simplicity. In fact, it corrects for previous errors automatically. We address point number 3 with an assumption that we are not going back to an environment where following marriage the male head of household works and the female stays home taking care of the kids. A comparison of unemployment rates between 2010 and 1950 is invalid but comparisons from peak entry of women in the workforce going forward are valid. Points number 2 and 4 can be addressed via elimination of retirement and education issues. We do this by careful selection of the "core age group" as follows. Core Unemployment: Number of people in age group 25-54 who are not working. Core Unemployment Rate: ((civilian population 25to54 - employment 25to54) / civilian population 25to54) * 100. The definition of "core unemployment" allows for six years of education and retirement at age 55, both generous allowances. Realistically, everyone else should be working except a relatively small (and constant) percentage of people who are genuinely disabled. Six years into a recovery, I think we can safely remove point number four. In the above chart you can see the clear effect of women entering the workforce. The absolute bottom in the core unemployment rate was in April of 2000 at 18.07%. The second lowest rate was January of 1999 at 18.18%. The first dip below 19% was in February of 1998 at 18.97%. Let's zoom in on a time frame that catches peak entry of women in the work forcé. Let's now investigate some interesting developments since the year 2000. Specifically, let's compare March of 2000 with March of 2015. For age group 25-54, there were 1,791,000 more people employed in March of 2000 than in March of 2015 even though the population of that age group increased by 4,712,000! This is remarkable given age that group 25-54 factors out retirement and allows for six years of education. On a population-adjusted basis, age group 25-54 has a staggering 6,503,000 employment shortage compared to the year 2000. This does not even factor in part time employment. If we make the assumption that women in the workforce should stabilize, it follows that core employment should stabilize in the neighborhood of 80-82% and core unemployment should stabilize in the neighborhood of 18-20%. In terms of normal retirement age, age group 25-59 might seem to be a better fit, but Fred does not have the Data. The BLS does have the data, but we have to manually add age groups together. Let's do a quick calculation of March 2000 compared to March 2015. Before the housing bubble burst, cyclical unemployment with each recession eventually corrected itself. We now have huge, unemployment (non-employment if you insist) that is not accounted for. To date, we could only see this in the declining labor force and participation rate. Yet, the participation rate itself is a poor measure. It is declining in part because of aging boomer demographics and in part because of the excess number of people who dropped out of the labor force. Disability fraud also entered the picture. Starting with a simpler definition of "unemployment" smooths all of those factors out. What we are left with is an economy that is roughly 6,503,000 jobs short of where it should be following six years of recovery (in age group 24-54 alone). That's how bad things are, at a minimum, and for the core group alone. And that's precisely what is wrong with existing measurements and economic analysis touting the "recovery in jobs" and "new highs in employment". Many people tell me this does not "feel" like a recovery. For 6.5 million people in "core age group" 25-54 there has been no recovery. And that number does not account for other age groups, for underemployment (e.g. engineers working in restaurants), for part-time employment, or for declining real wages for all but the top 10-20% or so. "The Fed is 'ever-interested' in doing something later," Jim Grant notes, explaining why he believes the timetable for rate hikes will be pushed back further as fear of allowing a free market in the "most critical" of prices - that of interest rates - would lead to the "unmasking of the misallocations of capital that will have come about through the levitation of asset prices." Grant further unleashes his verbal attack of truthiness when he points out that the central bank's persistent easy money policies is on display currently in the form of stifling American enterprise and sending millions of people from the workforce "more or less permanently." "If companies can't fail that means somebody else can't start. You're looking at a petrified forest rather than dynamic capitalism,"
Behold "The fruit of heavy-handed government manipulation... no matter what 'famous-blogger' Ben Bernanke says"